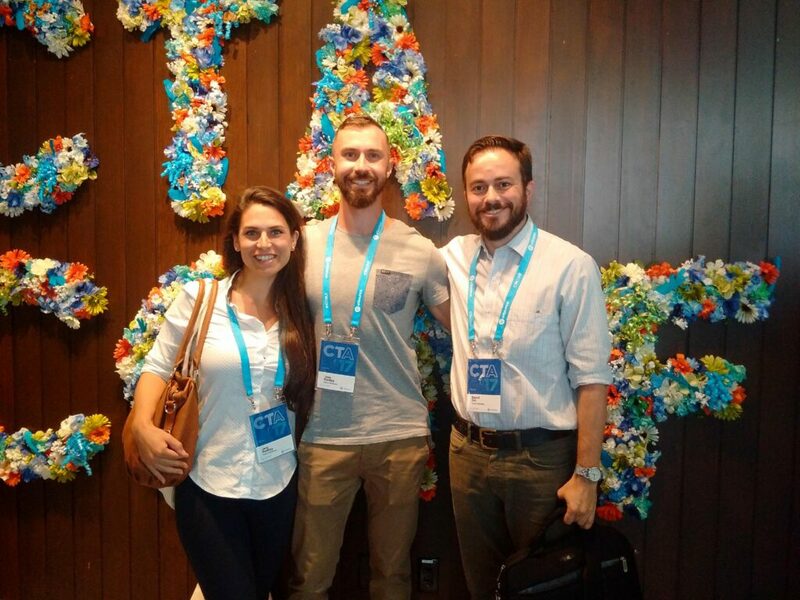 At the end of last month, three members of the Otium Boutique team set off from our respective corners of the globe to converge in Vancouver, Canada, for Unbounce’s Call to Action Conference 2017. Two days packed full of digital marketing wisdom from some of the industry’s leading speakers, there were plenty of valuable takeaways and actionable tips to gain. While A.I. and machine learning were hot topics of the event, with Unbounce’s “Machine vs. Marketer” putting even the savviest of marketers to the test, this wrap up post will focus on the some of the standout messages we heard at the 2017 CTA Conference and how they can specifically be applied to hotel marketing. Otium Boutique at Call to Action Conference 2017. Full of energy and a strong affinity for Bradley Cooper, Kindra Hall reminded us of importance of strategic storytelling in marketing. Whether it is telling the full story in your marketing videos, or delivering the promise of a story in your Facebook ad copy, storytelling is effective because people are naturally attracted to stories. Stories create an emotional connection, particularly when listeners form mental images of elements of the story that matter to them most. Storytelling, however, can be challenging and the biggest mistake often made is that we allude to the story, but don’t actually tell it. Redefine the beginning, middle, end. Engaging, strategic storytelling, according to Kindra, should be structured to tell the ‘normal’, the ‘explosion’, and the ‘new normal’. In order for your audience to connect with your story, they need to feel what the characters were struggling with, what changed, and what resulted because of it. Craft your story with detail. 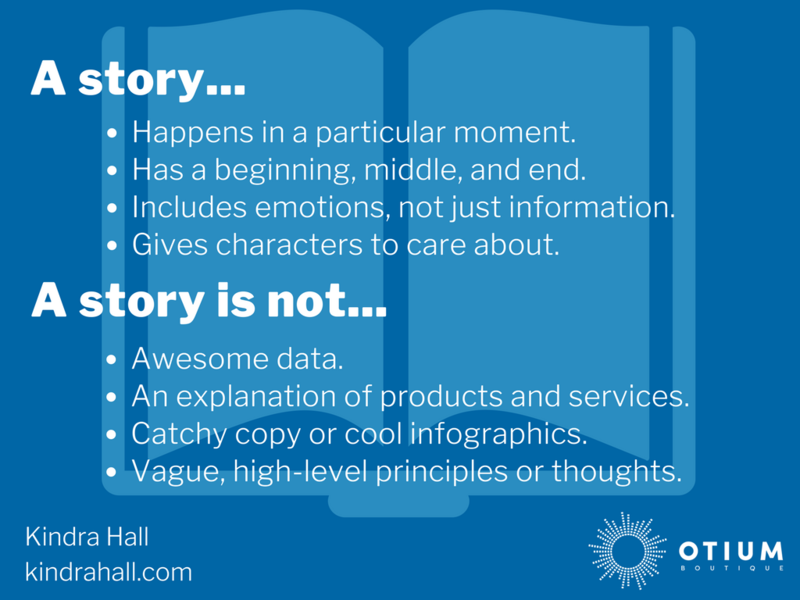 Effective stories include emotions, are specific, and set the scene. Create a vivid picture so those reading, listening or viewing feel as though they were there. Use data to form your story ideas. Data is not a story in itself, but provides a wealth of opportunities for potential stories. Analyze your guest data to determine who your customers are likely to relate to. Consider topics that regularly come up in guest interactions and previous guest experiences to establish interesting story themes. Review website and social media analytics to find which messages resonated with your audience. And, most importantly, use data from your hotel’s background and experiences as the basis of engaging stories that emotionally connect with potential guests. Kindra Hall identified what a story is and what it is not. Joel Klettke discussed how to read your customers’ minds – no Professor Xavier mutant superpowers necessary. To write engaging, specific and gripping copy, we must avoid the dry, boring language that marketers so frequently get caught up with. Instead we need to write as our customers would or, better yet, use their language. Keywords and buyer personas aside, Joel argued that the key to bridging the gap between the language of customers and creating engaging copy was understanding customers’ motivation – their pain points, anxieties, outcomes, and priorities – all in their own words. This idea of understanding your customer’s motivations, and the importance of using customer language to create powerful copy, was echoed in Claire Suellentrop’s presentation Out With User Personas: Creating Compelling, High-Converting Campaigns Using Jobs To Be Done. Follow a model of discovery. 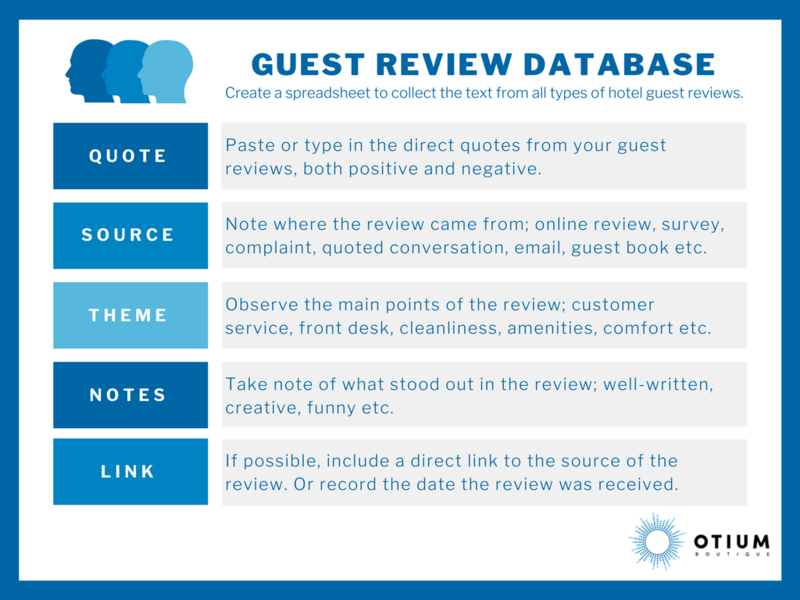 By asking your guests for their feedback, recording their responses, analyzing the results, and testing the success of your copy you can find common themes and language that guests use to review your hotel and which ones resonate most with your audience. These are the benefits that your guests see when they stay with you, and therefore the points you should be addressing in your marketing copy. Conduct interviews and surveys. Interviews and surveys are useful in eliciting deeper responses from your guests and understanding their experiences, not opinions. But to do this, you need to focus on the what, when, why and how by structuring your survey on before (the guest’s problem or motivation), during (their early experiences with your hotel), and after (your guest’s stay and any outcomes they achieved). Analyze reviews. Most likely, you’re already keeping a watchful eye on TripAdvisor and other sites to respond to guest reviews. Go one step further after checking those reviews by creating an easy-to-reference spreadsheet that contains pasted quotes, their sources, and your notes. You can then analyze the text for frequently used words, recurring themes, and well said copy – all of which will resonate with future guests because it ‘speaks their language’. Joel Klettke explained how a well-organized database of reviews is a goldmine of good marketing copy. Do you cringe when someone laughs at their own jokes? I do. But not when world-renowned Facebook expert Mari Smith hit the stage for an explosive, high-energy presentation that was jam-packed with tips around maximizing your ROI with this popular social media channel. While Mari discussed many aspects of how businesses can more effectively use Facebook, a key takeaway was the importance of video and its future prominence in the platform. Capitalize on the Facebook video window of opportunity. While a Buffer study noted that video posts get three times the engagement of other posts, of the seven posts that businesses were publishing a week less than one percent were video. Get ahead of your competition by using videos or Facebook Live, but be sure to stay true to your hotel’s identity and branding. Create more video content. Before you discount this takeaway for lack of budget, understand that videos don’t have to be a big budget, professional production. Mari showed the example of turning a still ad image into a simple, looping video with a flickering candle and falling sparkles – using the tool Lumiere. Even simple videos are favored by Facebook, positioning your posts higher in news feeds. As an added bonus, when you post videos you can create saved and lookalike audiences from those who watch your video and use those lists for remarketing. Go square. 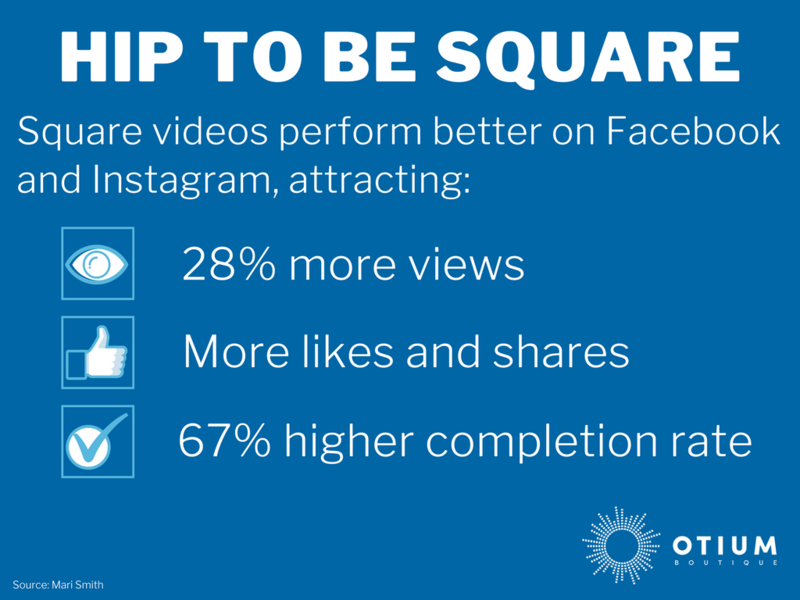 When creating videos, particularly for mobile viewing, square videos are your best bet. 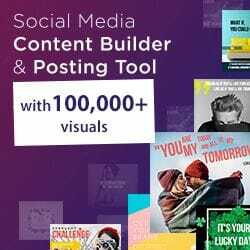 They perform better on Facebook and Instagram as they take up more of the screen, they attract 28 percent more views and more likes and shares than landscape videos, and garner a 67 percent higher view completion rate. Facebook guru Mari Smith spoke about the benefits of square videos. While Scott Stratten might have called out influencer marketing as simply the new term for sponsorship, Tyler Farnsworth explained that tapping into influencers allows us to market with the right voice, on the right device, and in the right distribution channels. With the growing popularity of social media, the celebrity is now ‘democratized’ and influencers, often everyday people, can amass huge audiences and massive reach. Tyler challenged marketers to stop creating noise and break free of boring advertising that disrupts our daily existence in poorly designed ways. Instead, marketers need to create better marketing experiences. And one way to achieve this is through influencer marketing. Start with the end in mind. If you want to use influencer marketing, start by defining your core objectives. What do you hope to achieve? How can influencers help achieve this? Visualize the end results of your campaign and then brainstorm remarkable ideas to standout in the world of influencer marketing. Recruit the right influencers for your brand. When choosing influencers for your hotel, don’t head straight for the influencer with the largest audience. Choose influencers who are authentic and the best fit for your brand. Where can you find them? Start by looking at your loyal guests and current followers. Select influencers who are excited to represent your hotel and help them to be successful by providing a brief that gives background information on your hotel and brand, defines the campaign objectives and content deliverables, and outlines critical dos and don’ts. Amplify your influencer’s content. Go leaps and bounds ahead of your competitors by amplifying your influencer’s content with marketing spend. You can dramatically extend the reach by using paid social to boost your influencers’ content. 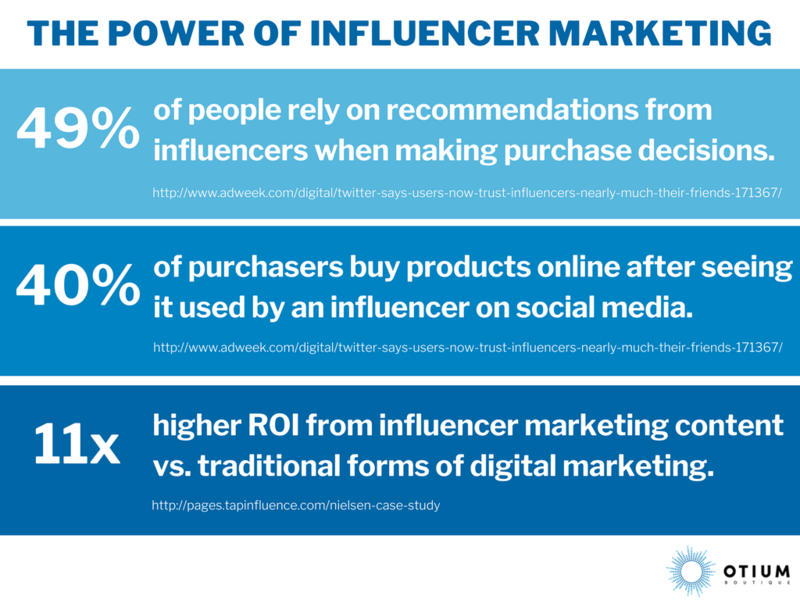 Tyler Farnsworth explained influencer marketing can be very effective when done correctly. There is so much more we could report in in our recap of the Call to Action Conference 2017. In fact, we’ve also created a post dedicated specifically to conversion rate and search engine optimization (CRO and SEO) – a topic covered by both Wil Reynolds and Rand Fishkin in their presentations at the event. Whatever marketing tips you walked away with from the conference, the ultimate takeaway comes down to delivering human-centered marketing. Irrespective of the stories we tell, the copy we write, or the platforms we engage with, as marketers we all have to ask ourselves, “how are we helping people solve their problems?” Because, at the end of the day, helping people is what it’s all about. 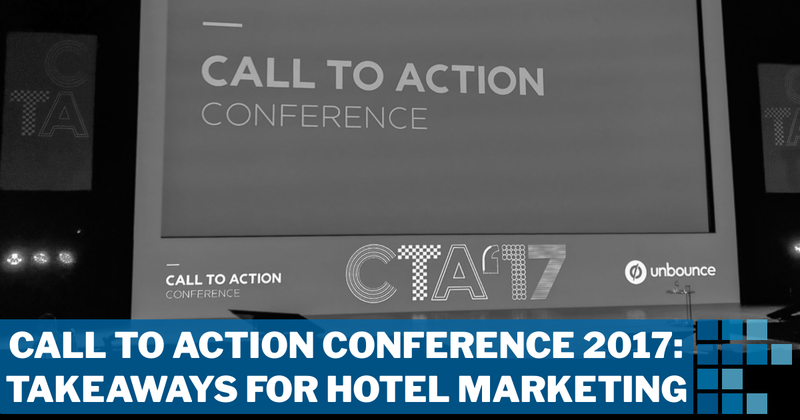 If you’d like to learn more about the Call to Action Conference, or how we can put the tips we took from the event to work for your hotel’s marketing, contact us today. A former primary school teacher come digital marketer, Jess was born to help others and organise everything - all in the most colourful and creative ways possible. When she's not managing the Otium Boutique team, she's playing in the mountains.